Sedona can be found amongst the colorful and striking red sandstone formations close to the Oak Creek Canyon, in Arizona (AZ). The Sedona area is a beautiful part of southwest America and features some of the country's most spectacular landscape. Sedona has become a flourishing New Age tourist destination, attracting many visitors each year. Offering distant views of the Mogollon Rim, Sedona offers a surprising number of resorts, shops and restaurants, often with stunning backdrops. Sedona is well placed for excursions around central Arizona and many natural landmarks are located just a short trip from the outskirts, a number of which have been used as Hollywood movie locations. Tourism has found Sedona and the area now attracts over four million tourists each year. 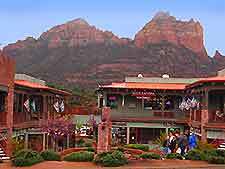 The main tourist information center in Sedona is the Chamber of Commerce along Forest Road. With detailed information about all of Sedona's main tourist attractions, where to stay, popular day trips and maps, this center is the place to come for helpful, friendly tourism advice. The Sedona area offers a wealth of accommodation, although there are few inexpensive motels in this region, being concentrated around nearby highways. 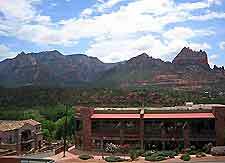 Hotels in Sedona can be found around the lively Uptown area, throughout western West Sedona, in the Village of Oak Creek, around the nearby Oak Creek Canyon, and close to Sedona Airport (SEZ). 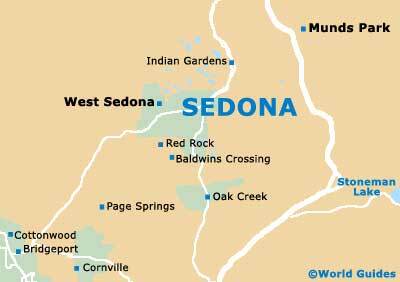 More information about Sedona Hotels. Sedona has plenty of major tourist attractions, including the world-famous Chapel of the Holy Cross - a unique little chapel built into the rock face, offering spectacular views; Verde Canyon Railroad - enjoy a delightful journey along the North Verde River, featuring many attractions along the way; and Oak Creek Canyon - a spectacular canyon close to central Sedona, offering campgrounds, parks, hiking, swimming, inns and resorts. 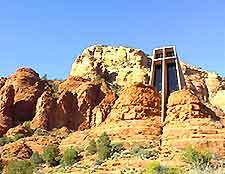 More information about Sedona Tourist Attractions. Some of Sedona's most popular museums and art galleries include the Sedona Arts Center - featuring a wide range of cultural events and displays; the Sedona Heritage Museum - presenting an insight into the history of this area; and the Montezuma Castle National Monument - with a nearby museum providing a wealth of information about this ancient castle. More information about Sedona Museums and Art Galleries.